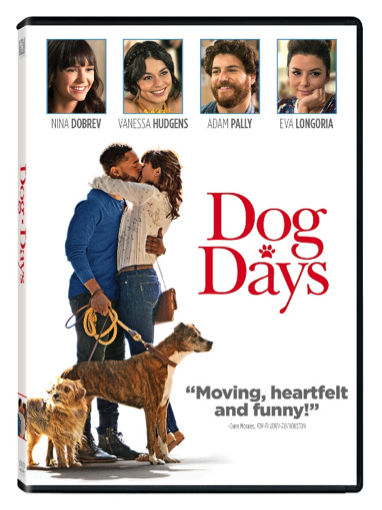 Twentieth Century Fox Home Entertainment presents DOG DAYS, arriving on Digital and Movies Anywhere November 6th and DVD November 20th. Movies Anywhere simplifies and enhances the digital movie collection and viewing experience by allowing consumers to access their favorite digital movies in one place when purchased or redeemed through participating digital retailers. Movies Anywhere brings together the movies from Sony Pictures Home Entertainment, Twentieth Century Fox Film, The Walt Disney Studios (including Disney, Pixar, Marvel Studios and Lucasfilm), Universal Pictures and Warner Bros. Participating digital retailers at launch are Amazon Video, Google Play, iTunes and Vudu. Movies Anywhere offers a library of over 7,300 digital movies at launch, including new releases, and will continue to expand the consumer experience as more content providers, digital retailers and platforms are added. Using the free Movies Anywhere app and website, consumers can connect their Movies Anywhere account with participating digital retailers and enjoy their favorite digital movies from the comfort of their living room and across multiple devices and platforms, including Amazon Fire devices; Android devices and Android TV; Apple TV; Chromecast; iPhone, iPad and iPod touch; Roku® devices and popular browsers. Consumers can also redeem digital codes found in eligible Blu-ray and DVD disc packages from participating studios and enjoy them through Movies Anywhere. Movies Anywhere is available to residents of the United States, its territories, and certain associated states. For more information, visitwww.moviesanywhere.com.